BIRMINGHAM, Ala. (AP) — Takuma Sato had one "little moment" when his car went into the grass late in the race. PORTLAND, Ore. (AP) — Scott Dixon claimed to remember little about his last race at Portland International Raceway, a visit 16 years and four championships ago. Should he win a fifth IndyCar title this season, his return to the Pacific Northwest will be one he never forgets. Dixon salvaged his championship run Sunday with an improbable comeback that made the championship his to lose. PORTLAND, Ore. (AP) — Scott Dixon salvaged his championship run with an improbable comeback Sunday at Portland International Raceway that put him in control of his race to a fifth IndyCar title. INDIANAPOLIS (AP) — Helio Castroneves and Sebastien Bourdais each tried to make the most of a rare passing opportunity during the second half of Sunday's Indianapolis 500. Tony Kanaan and Danica Patrick, they spun out and crashed, too. INDIANAPOLIS (AP) — Part-time drivers and one-off rides are usually afterthoughts at the Indianapolis 500, where the sport's brightest stars tend to shine in the hot sun on the final Sunday of May. INDIANAPOLIS (AP) — Takuma Sato learned a tough, painful lesson from his spectacular final lap crash at the 2012 Indianapolis 500. The Japanese driver believes he might not be the defending Indy winner heading into Sunday's race had it not been for the ill-fated passing attempt that sent him spinning hard into the first-turn wall and gave Dario Franchitti his third and final race win six years ago. The fans lined up one by one in the most orderly fashion, waiting for their chance to take a photograph or snag an autograph from the first Japanese winner of the Indianapolis 500. Good thing they were patient, too. Takuma Sato spent time chatting with every single one of them. Sebastien Bourdais has won the season-opening race in St. Petersburg — a victory handed to him when Alexander Rossi and Robert Wickens crashed racing for the lead. Wickens was heading to a victory in his IndyCar debut until two late cautions gave Rossi a chance to take it away. ST. PETERSBURG, Fla. (AP) — Oriol Servia will enter the Indianapolis 500 in a joint effort with Rahal Letterman Lanigan Racing and Scuderia Corsa, which will be making its IndyCar debut. Servia will be a teammate on the Honda team with Graham Rahal and defending Indy 500 winner Takuma Sato. DETROIT (AP) — When Takuma Sato won the Indianapolis 500 last year, owner Michael Andretti understood right away how significant the victory was. INDIANAPOLIS (AP) — The Borg-Warner Trophy that honors the Indianapolis 500 winner left the United States for the first time in its 82 years on Tuesday to celebrate Takuma Sato's victory in Japan. The trophy's permanent home is the museum at Indianapolis Motor Speedway. It headed to Tokyo for a 15-day tour of festivities for Sato, the first Japanese winner of "The Greatest Spectacle in Racing." The tour also is celebrating Honda's 12th Indianapolis 500 victory. INDIANAPOLIS (AP) — Indianapolis 500 winner Takuma Sato will return to Rahal Letterman Lanigan Racing next season. Sato spent just one season with Andretti Autosport and became the first Japanese winner of the 500. Sato drove for Rahal in 2012 and nearly beat Dario Franchitti in attempting to win the Indy 500 that year. Sato crashed on the final lap trying to pass Franchitti for the lead. FORT WORTH, Texas (AP) — Will Power was trying to figure out how to hold off Scott Dixon for the lead as the two went side-by-side in the closing laps of the IndyCar race at Texas. Instead, Dixon got taken out in one last crash to end a wild race at the repaved and reconfigured 1 1/2-mile track and Power won under caution. Only eight of the 22-car field actually crossed the finish line Saturday night. Instead, Dixon got taken out in one last crash to end a wild race at the repaved and reconfigured 1 1/2-mile track. Only eight of the 22-car field actually crossed the finish line Saturday night. DETROIT (AP) — Graham Rahal of Rahal/Letterman Lanigan Racing set a track record and earned the pole for Saturday's Detroit Grand Prix IndyCar race. Rahal covered the 2.36-mile, 13-turn temporary road course in 1 minute, 13.9681 seconds at 114.966 mph. His time from the first round of qualifying stood up after IndyCar officials wiped out the fastest lap turned by Team Penske's Helio Castroneves when he was penalized for not slowing down during a caution. DETROIT (AP) — Takuma Sato is in for quite a shift. And, it doesn't have much to do with him becoming the first Japanese driver to win the Indianapolis 500. Last week at Indianapolis Motor Speedway, Sato and his fellow IndyCar drivers raced 230-plus mph on straightaways and turned left at 220 mph into four corners on a smooth track. Takuma Sato took the checkered flag at Sunday's Indy 500. Then he took a victory lap, the traditional gulp of milk and a $2.5 million payout. But Sato didn't take all the glory. Some of that reflected onto Ruoff Home Mortgage, the Fort Wayne-based lender that sponsored Sato's car. NEW YORK (AP) — There is no rest for Indianapolis 500 champion Takuma Sato, and that's OK. 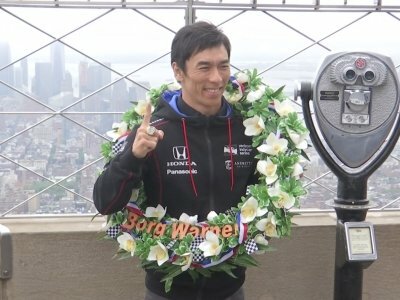 Still ecstatic on Tuesday at his new place in history as the first Japanese driver to win "The Greatest Spectacle in Racing," Sato posed for photos atop the Empire State Building, rang the Nasdaq opening bell in New York City's Times Square, and continued to bare his soul as he pondered his accomplishment. DENVER (AP) — A veteran sports writer is no longer working with The Denver Post after he posted on Twitter that he was "uncomfortable with a Japanese driver winning the Indianapolis 500 during Memorial Day weekend." Terry Frei sent the tweet after Takuma Sato on Sunday became the first Japanese driver to win the race. INDIANAPOLIS (AP) — Takuma Sato had victory in sight once before at the Indianapolis 500. When he attempted a last-lap pass, Sato lost control of his car, crashed and Dario Franchitti went on to his third victory in "The Greatest Spectacle In Racing." In nearly the same position five years later, Sato leaned on lessons learned in that 2012 defeat and became the first Japanese driver to win the Indianapolis 500. INDIANAPOLIS (AP) — At the end of 500 miles around Indianapolis Motor Speedway, it was a former Formula One driver who took the checkered flag. INDIANAPOLIS (AP) — Helio Castroneves insisted all week he had a car that could win the Indianapolis 500. INDIANAPOLIS (AP) — Ed Carpenter turned a tough draw into a winning hand Saturday. INDIANAPOLIS (AP) — Sebastien Bourdais posted the fastest lap of the week during Friday's Indianapolis 500 practice session and kept the top spot even after a two hour, 36-minute rain delay. The French driver finished with a top speed of 233.116 mph. It was the second-fastest speed for a driver who wasn't drafting someone else as Dale Coyne Racing became the fifth different team in five days to lead a pack of more than 30 cars on the 2.5-mile oval. AVONDALE, Ariz. (AP) — Simon Pagenaud appeared to be on cruise control after taking a big lead when a caution flag caught the other leaders on pit road in the Verizon IndyCar race Saturday night at Phoenix International Raceway. The Frenchman had a different view from the cockpit as he closed in on his first oval victory. INDIANAPOLIS (AP) — Japanese veteran Takuma Sato will drive the No. 26 Honda for Andretti Autosport during the 2017 IndyCar season. LONG POND, Pa. (AP) — Mikhail Aleshin has won the IndyCar pole at Pocono Raceway. Aleshin, fastest in morning practice on the tricky 2.5-mile triangular track, turned a fast lap of 220.454 mph in his No. 7 Honda to edge Josef Newgarden for the top spot Saturday. It's the first career pole for the Russian, who drives for Schmidt Peterson Motorsports.